Do you love snacking on mouthwatering treats but also hope to lose some fat? Now, you can support your well-balanced diet plan by indulging in new appetite suppressant gummies called Skinny Piggies! 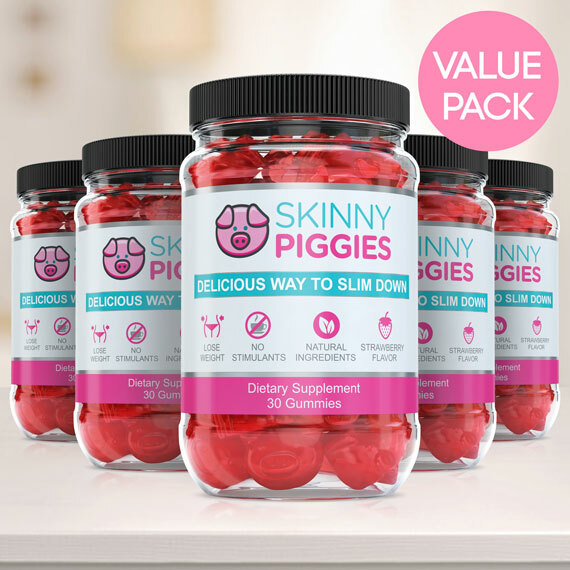 Skinny Piggies are strawberry flavored natural gummies that combat food cravings and hunger while enabling your body to continue being in fat-loss mode. If you want to lose weight, it is simple: Eat less calories than your body burns and you'll lose weight, it's that simple! But as soon as you start lowering calories, food cravings will set in, and appetite and hunger become impossible to deal with. This is where Skinny Piggies come to the rescue! These yummy appetite suppressants are developed to not only help you fulfill those cravings, but also help you to stick to your diet plan by making you less hungry. Hunger is primarily controlled by 2 ways: caloric intake and the stretch in the stomach. When you eat food, your stomach becomes full and the food stretches against the stomach walls. This creates the feeling of satiety and you stop eating. Chew a Skinny Piggy 30 minutes before your dinner with a full glass of water. Once the Skinny Piggy gummy reaches your stomach it will absorb the water and turn into a delicate gel. The gel then uses up space and notifies your brain that you just ate a good portion of food - and that's before you have eaten real food. 30 minutes later and you are all set to eat your desired food! Now, the gel has expanded and you are to some extent full which means you will eat much smaller serving and consume a lot fewer calories but still find yourself feeling full . Have one Skinny Piggy gummy and you'll find yourself eating fewer calories, reduce cravings and help your body to burn fat for longer all while feeling full. This means you can fight appetite and hunger, food cravings, and keep your calories down, without seeming like you're eating less than before. When you eat the Skinny Piggies hunger reducing gummies right before meals, they will form a gel-like coating around your food, which slows down the release of the glucose you consume into the blood stream. This helps keep your blood glucose much more stable and makes sure that your body remains in fat burning mode for many hours. It can also help make your workouts feel a lot easier. What's Different about Skinny Piggies? Skinny Piggies have zero artificial additives - you can actually read and pronounce each of the active ingredients. The healthy, natural ingredients used in Skinny Piggies also have multiple health benefits including things like support for strong hair and nails, glowing skin, and anti-aging properties. Aside from that, Skinny Piggies contain zero stimulants. This is a significant point because when you eat stimulants, not only are you risking suffering from burnout and fatigue down the road, but it limits when you can use them. Take a stimulant based fat burner in the evening and make no mistake about it, you won't sleep that night. With Skinny Piggies, you can take them even at night without a problem. There are no such restrictions with this product. Finally, what other fat loss product is as yummy as a strawberry flavored gummy? 'Thought so. You will enjoy consuming these so remembering to take your diet supplement will definitely no longer be a hindrance. They're simple to use and you can get going right now. Try one and they will certainly become a highlight of your day.